Prof. ZHOU Yongjin from the Dalian Institute of Chemical Physics (DICP) of the Chinese Academy of Sciences, in collaboration with Prof. Jens Nielsen and Dr. Eduard Kerkhoven from Chalmers University of Technology, reviewed the barriers and opportunities in bio-based production of hydrocarbon biofuels. And the review was published in Nature Energy. The transport sector accounts for one of the largest and fastest growing consumers of energy. Even though there are projections of a rapid increase in electric cars, high-power transport vehicles (airplanes, ships and long-haul trucks) need high energy-density fuels (including high-capacity energy storage, fast energy release and rapid charge), and current alternative energy storages (mainly batteries) cannot meet this requirement. The current fossil fuels cause greenhouse gases (GHG) emission. Thus, there is an urgent need to establish alternative sustainable routes for production of liquid fuels with high energy densities. Biotransformation of biomass or other renewable resources toward biofuels is considered as a green route for production of liquid fuels, biochemical, and etc. (Figure A). The review first introduced that the current environmental pressure requires clean liquid fuels, and a recent report showed that camelina oil-derived biofuel blending into traditional jet fuel (50:50 by volume) reduced the particle and mass emissions by 50–70%. However, plant oil production is low efficient and also easily suffers from geography and climate factors. 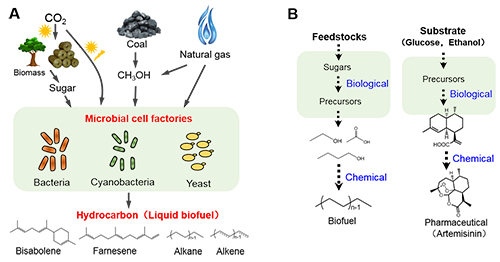 Construction of robust microbial cell factories for biofuels production, by using biomass and natural gas as feedstocks, would be a feasible approach for future clean energy supply. The study summarized the recent progress in engineering microbes for biosynthesis of different hydrocarbon molecules, including derivatives of fatty acid, isoprenoid and polyketide. Especially, bio-based production of farnesene, an ideal jet fuel and alternative which can be used for rubber manufacture, reached industrial level and a factory has been established in Brazil for industrial production. It also discussed the challenge in construction of robust microbial cell factories with high efficiency and resistance againt harsh industrial conditions. The review emphasized that biological and chemical processes should collaborate by taking their own advantages, which would facilitate the feasible route toward sustainable production hydrocarbons and even other chemicals (Figure B). In fact, the synergy between biological and chemical processes has been well used for production of alkanes and pharmaceutical artemisinin. Engineering utilization of single-carbon feedstocks for bio-refinery would expand the current single-carbon economy and improve the sustainable production of biofuels and chemcials.